And so we come to the Book of the Year round-up. I’m not waiting till the holiday season this time, as I realise that many readers would prefer to hear my thoughts now, just in case it inspires their Chris tmas shopping. And why not? Buy someone a book for Christmas this year. It’s more fun than socks. Well, your mileage may vary. 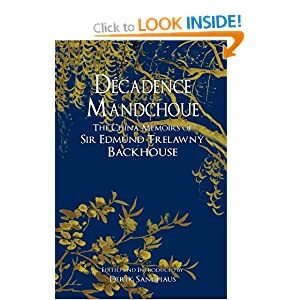 Runners-up from my reading this year include the utterly filthy Decadence Mandchoue: The China Memoirs of Edmund Trelawney Backhouse, rescued from obscurity by Derek Sandhaus in a beautiful hardback edition by Hong Kong’s Earnshaw Books. I was left thoroughly depressed by Paradise Found, an informative account of the American ecology on the eve of the arrival of European colonists. 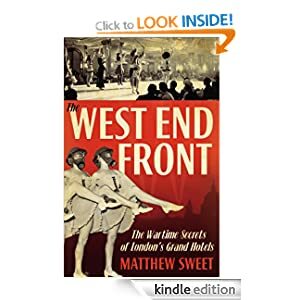 Also, sped to me on the day of its publication, Matthew Sweet’s West End Front: The Wartime Secrets of London’s Grand Hotels. Sweet’s previous books changed the way I wrote history; I have come to love his persistence in tracking down testimonials rather than memoirs, a dogged quest that often seems to find him sipping tea in old people’s home while the spivs, movie stars and spies of yesteryear struggle to recall their glory days. West End Front is a carnival of (largely) ghastly people, often described with Wodehousian glee, and Sweet presents a superb angle on the culture of WW2, from the switchboard operator who overheard of the war’s arrival before the rest of the country, to the huddle of ousted politicians listening on a hotel radio to the news of Japan’s surrender. Kings in exile, hookers on the make, and Marxists in search of a bespoke bomb shelter all rub shoulders in Sweet’s vivid account, some under the mistaken impression that the solidly built hotels of London were “bomb-proof.” I would say more, but Simon Guerrier already has. 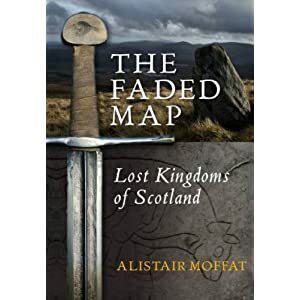 For the second year running, my fortnight at Scotland Loves Anime found me raiding the Glasgow Waterstone’s, coming away with the wonderful Lore of Scotland and The Faded Map, a run-down of the various kingdoms once found in Caledonia. The focussed, localised Faded Map has been overshadowed somewhat by Norman Davies’ sprawling Vanished Kingdoms: The History of Half-Forgotten Europe, which offers potted histories of continental also-rans such as the Byzantine Empire, Aragon, Burgundy and Tolosa. But through no fault of Davies, I was left slightly more satisfied by The Faded Map, partly because it set its sights very small, on Scotland, and hence was able to be far more comprehensive. There is a picky, ungrateful sense of entitlement that comes over the reader of Davies’ larger work, as one starts to wonder about all the vanished realms he’s left out – what about al-Andalus? The Danelaw? The Austro-Hungarian Empire…? His book is popular enough and has made it onto many other best-of lists this winter, so perhaps it will soon gain a companion volume. If it does, may I plead with his publishers to make a better book. For £30, I would prefer one that doesn’t start shedding its pages before I’ve even got halfway in. By the time I finished, it was less of a book than a sheaf of papers. 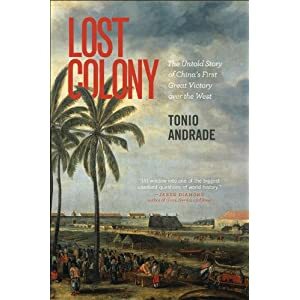 Lost Colony by Tonio Andrade is an impeccably researched account of the fall of Fort Zeelandia in Taiwan to the “pirate king” Koxinga, a.k.a. Zheng Chenggong, Coxinga, the Knight of the Imperial Surname, etc. Barnacled with grants and fellowships, and aided by four research assistants, Andrade reframes the story of Fort Zeelandia in terms of the popularly-held idea of the inherent superiority of the modern west. He points out that when the Chinese first met with European military might, the Chinese won, and ponders if the victimhood of the 19th century was an anomaly. Entertainingly, Andrade is not above arch comments about the Dutch disaster as it unfolds, and has the odd achievement of including a chart that made me laugh out loud. It’s a list of defectors in each direction between the Dutch and the Chinese, but is set up with such mathematical precision that it allows for the possibility of half a defector. A lower torso, perhaps? For reasons I don’t quite follow, this playfulness also extends to the book’s cover, which shows a picture of Batavia, not Taiwan at all. When I clicked a copy of Andrade’s book into my shopping basket, Amazon kindly informed me that “people who bought Lost Colony also bought Coxinga and the Fall of the Ming Dynasty by Jonathan Clements”. This is somewhat ironic, since Coxinga and the Fall of the Ming Dynasty is entirely unmentioned in Lost Colony, which has the gumption to bill itself as an “untold story.” There’s some half-hearted hand-wringing in Andrade’s acknowledgements about his “scholar’s discomfort” with this claim, but it apparently didn’t bother him enough to actually do anything about it. Which is a shame, because Lost Colony is an excellent book, and now many would-be readers will be confronted its spurious “untold” assertion every time they browse an online bookseller. It is, one presumes, because academic presses do not wish to dirty themselves with citations from the garish world of commercial publishing, a reluctance which, to some extent, I do understand, particularly if someone has inconveniently told your “untold” story eight years previously – and I, of course, was not even the first. But if you are going to dismiss popular predecessors as beneath your notice, please don’t succumb to the hucksterish allure of misleading, grandstanding titles. Untold, my arse. 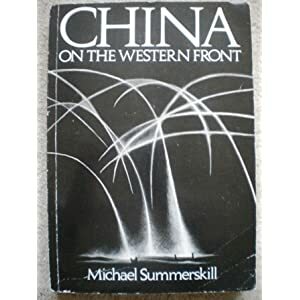 Which brings me to my actual book of the year, which I doubt very much you could buy even if you wanted to: China on the Western Front, by Michael Summerskill. Untold? No. Unread? Seemingly. Unloved? Absolutely not. 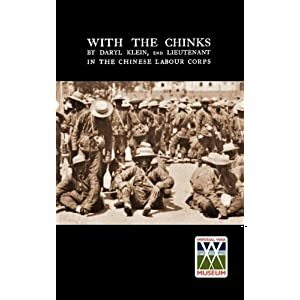 It’s an amazing book about the Chinese Labour Corps, nearly 100,000 men who came from China to dig trenches and unload ships in a Europe starved of manpower during WW1. Eight hundred of them died, mainly from the influenza of 1918, although several dozen died in bombing raids and German attacks. It was published in 1982, and is so obscure that the School of Oriental and African Studies library doesn’t have a copy. It’s a paperback of less than 250 pages, acquired for the princely sum of £85 from a second-hand bookseller who knew exactly how much it was worth to me. I bought it because I’m considering writing a book of my own about WW1 in the Far East, and the fact that 100,000 Chinese put a girdle round the Earth in order to drag corpses from the trenches at Verdun is simply fascinating. Summerskill plainly found his obsession so odd, so unique, that no publisher would touch it. He published it himself, in numbers so tiny that I doubt there are three copies left in Europe. But nevertheless, thanks to the interwebs, I was able to find a copy. And if Summerskill’s family ever want to republish it, they could have it available on the Kindle in days. Has its time come? I hope so. We stand on the verge of a sea-change in publishing. Summerskill’s book, still a great rarity in 2011, might easily be a similar print-on-demand or e-Book commonplace by this time next year, easily rushed to your door or to your tablet. I have two books coming out in 2012, and for what is for me the first time, both will be in dual paper and electronic versions as my publishers wake up to the potential of new media. My reading this year has been skewed more than ever by the technology that delivers it to me. Amazon, in particular, reminds me to put money down on books I forgot I once wanted, or hunt down obscurities that might have eluded me in a bookshop. I have also noticed with increasing regularity, the number of books from academic presses that have clearly been printed on demand, to meet my order and not in anticipation of it. Nothing, however, quite competes with the joy of poking around a real-world Foyle’s or a Waterstone’s, where acres of new worlds are waiting to be discovered, analogue style. I’m not one of the publishing doomsayers. There is certainly a paradigm shift in the way that books are sold and consumed, but if anything it makes the field more financially rewarding for writers, not less so. I have certainly benefited from both paper and e-sales this year. I suspect that within the decade, the default condition of all books will be electronic, and that old-fashioned people like me who want it on paper can pay to have their digibook made real, much as 18th century bibliophiles popped down to the printer to have their papers bound. But there will be a transitional phase when electronica dominates, and when that comes, you’ll have a lot more trouble putting a ribbon around it and giving it to your dad. So buy someone a book for Christmas this year. Next year you might have nothing to give but electrons.